Sporadic outbursts of things that have to do with research, electronics or coding that may or may not be DSP related. When I accepted my current Postdoc position, knowing it would mean a move from Canada to France, I decided to all but completely dissolve my classic computer collection. I just kept my Commodore 8-bitters, that are now in boxes at a friend's place in Pointe-Claire, QC. However, here in Rennes (and probably everywhere else in France) there are a lot of "braderies", basically organized neighborhood garage sales; we have found these to be a great source of things we need. And sometimes, one sees something that can't just be left. 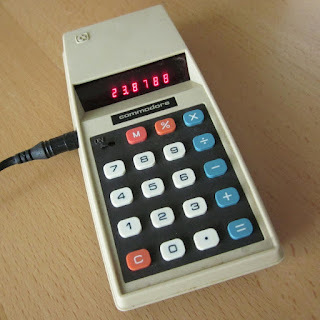 Like this Commodore 4-op calculator (Model 776M). For €1. No, I won't hack it, it's just too damn cute.